I’ve just finished reading Stephen King’s, On Writing: a memoir of the craft. It is part memoir and part guide book for the aspiring writer. I have observed in the past that while, one hopes, there may be significant differences between what goes into a work of fiction and a carefully researched piece of social research, when one sits down in front of a blank screen to communicate ideas the challenges can be remarkably similar. King’s book is full of useful advice. While some of it obvious, it is no less valuable for that, and it is considerably more engaging than staid self-help guides one might read. He does suggest that, ‘for any writer, but for the beginning writer in particular, it is wise to eliminate every possible distraction.’ There should be ‘no telephone in your writing room, certainly no TV or videogames for you to fool around with’. On writing was published in 2000, but one might now add, disconnect the internet or at least switch off social media. Although King does admit that he works to loud rock music like AC/DC, Guns ‘n Roses and Metallica! Once the door is closed, King suggests a daily target and that the door stays closed until that goal in met. As with physical exercise, to avoid discouragement he suggests setting a low target to begin with. His recommendation to begin by aiming for 1000 words a day is fairly standard in guides to writing. 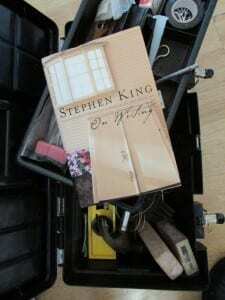 The writer’s toolbox, King suggests, is not a physical thing, it has nothing to do with pencils, pens and notebooks, and may therefore be less physically demanding to carry, but it should be no less complete and failure to have a well-stocked toolbox is likely to be discouraging. It is comprised of those intellectual tools which will make the process of writing easier. Like the carpenter’s toolbox, the writer’s toolbox should have several levels and the tools within it should be well maintained, ‘if some are rusty (as they may be if you haven’t done this seriously in awhile), clean them off.’ The most commonly used tools, King suggests, should be kept at the top. The first two levels should be comprised of vocabulary and grammar, with additional levels, drawers and boxes containing information on style, paragraphs and sentence structure. There is much else of interest in King’s memoir/guide, but for those who are not interested in how King became a writer, or how he got back to writing after a one-sided encounter with a truck in 1999, I would strongly recommend the chapters on the writer’s toolbox (pp.111 -137) and the section on paragraphs (pp.129-135) in particular, and the sections on reading (pp.145-154), the writing room (pp.155-162), revising (pp.208-220) and the ideal reader (pp.220-227). 2nd draft = 1st draft – 10%. Stephen King, On writing: a memoir of the craft, New York: Scribner 2000. The book was serialised in The Observer in 2000, there are also, inevitably, a huge number of interviews with King on the subject including this and this from The Atlantic and this from Open Culture.